Cartoon History of the Modern World by Larry Gonick. Using these two books as our spine, we’ll delve deeper into the material using a variety of living books and resources to get a deep understanding of history and the people who lived it. The literature this year provides a peek into history through the eyes of people who lived during major events (historical as well as fictional). Follow Waman as he sees the great Incan Empire fall apart with the arrival of the gold hungry Spanish in The Gold Eaters. View how the slave trade affected both the Africans who remained and those who were sold into slavery in Homegoing , and experience life in a concentration camp with the enigmatic Dita Kraus in The Librarian of Auschwitz. We’ll also be learning about poetic forms as well as writing our own poetry using The Making of a Poem: A Norton Anthology of Poetic Forms. The science focus this year is Chemistry using the free text CK-12 Intermediate Chemistry as our spine, then fleshed out with several living books to make the subject come alive. The elective this year is the History of the English Language. You will delve into a study of word origins and the history of language using Excavating English as our spine, along with some fascinating books about grammar, the history of words, and the making of the Oxford dictionary. This is going to be an amazing year of learning! 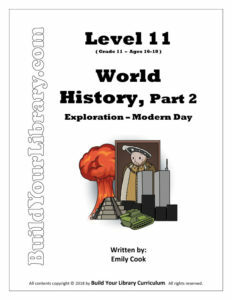 Have you already purchased Level 11 – World History, Part 2? We would you love to hear what you think and share your experience with others – Please feel free to leave a product review on the Contact Us page! Thanks for your support!